Its area consists mostly of a large plateau some 100 metres above sea level, up to 300 m wide and 1 km long, the site of a powerful medieval fortress. 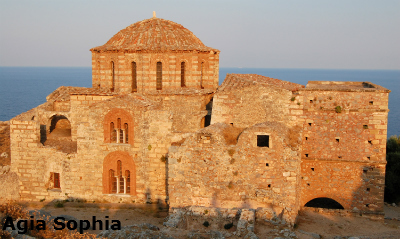 The town walls and some Byzantine churches remain from the medieval period. 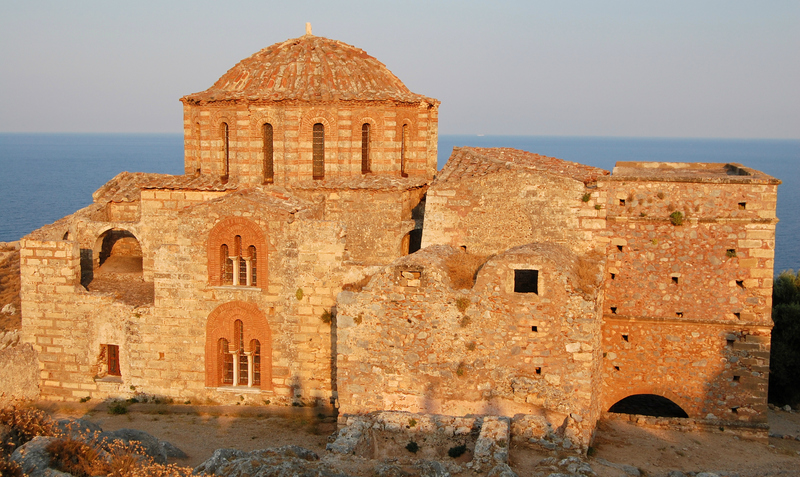 The Byzantines founded Monemvasia in the sixth century and shortly afterwards it became an important port. It was in Byzantine possession for almost seven hundred years when was captured by the Franks in 1249 after a three year siege. It returned to the Byzantine's ten years later and became the main port of the Despotate of Mystra. Its name derives from two Greek words, mone and emvassi, meaning single entrance. 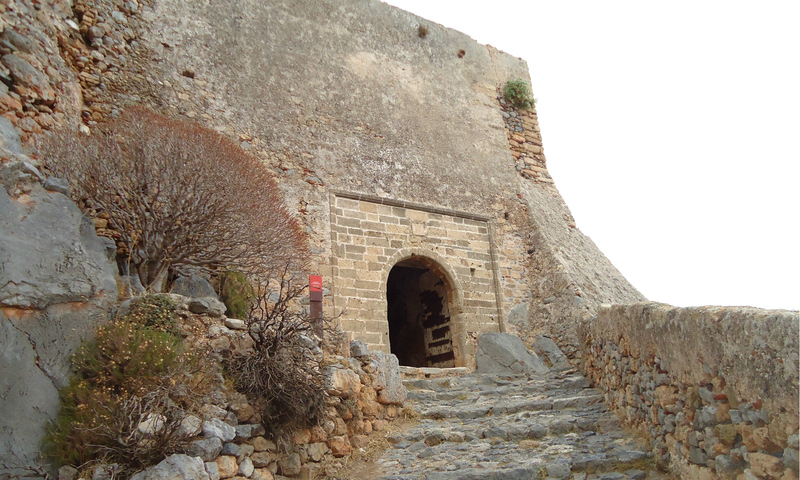 When the rest of the area was captured by the Turks in 1460, Monemvasia remained unoccupied by being under the control of the Pope from 1460 to 1464 who later gave it to the Venetians who held it from 1464 to 1540. 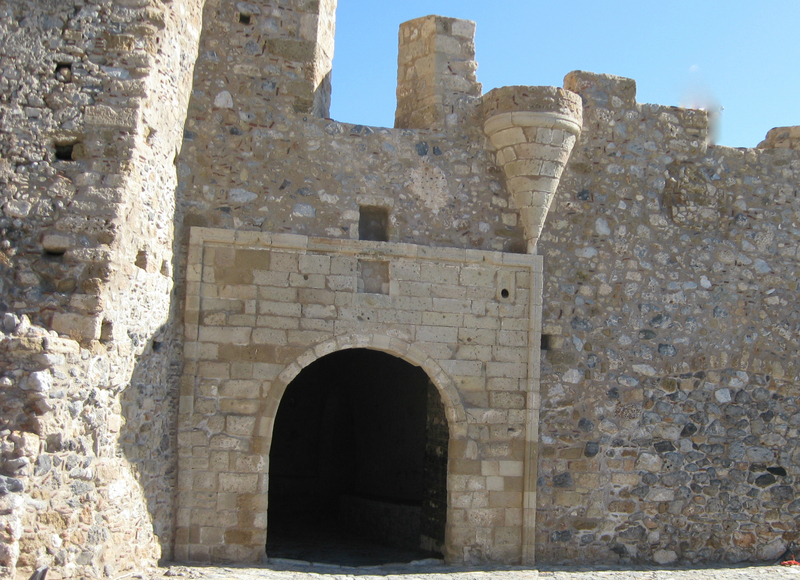 In 1540 the Turks gained control of Monemvasia after the Venetians abandoned their garrison. 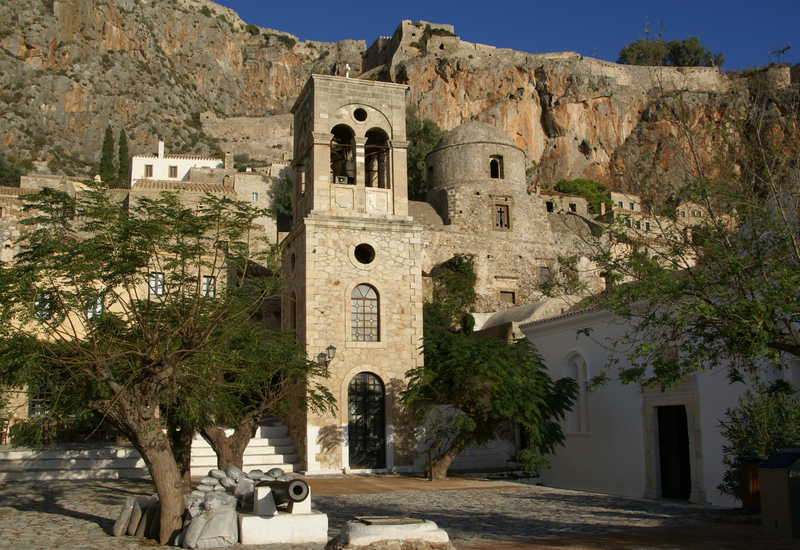 Although Monemvasia experienced decline under Turkish control, it underwent a revival when it returned to Venetian hands between 1690 and 1715. It then became the centre of the wars between Venice and Turkey. The Venetians called it the Neapolis of Malvazia because of the fine, aromatic wine Malvazia (Malmsey) that was transported to the West via Monemvasia. In the War of Independence, Monemvasia was the first of the major Turkish fortresses to fall after a four month siege and on August 1st 1821, overcome by misery and illness the Turks agreed to surrender to Demetrios Ypsilantis. 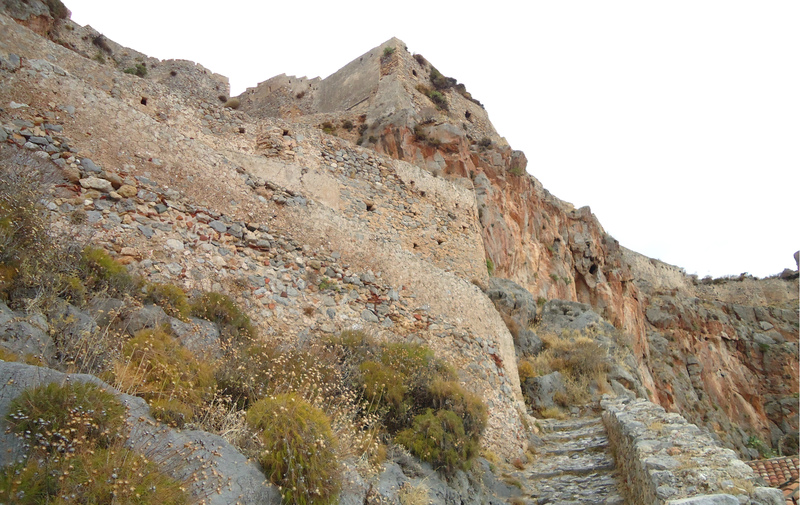 Today a causeway links the mainland town of Gefira/New Monemvasia to Monemvasia or Kastro (castle). The Kastro is divided into a lower and an upper town. There are many ruins of the original 800 houses and some of the original forty churches can be found in the lower town. The streets in the lower town and very narrow and can only be used by pedestrians. (Cars have to be left outside the main entrance.) 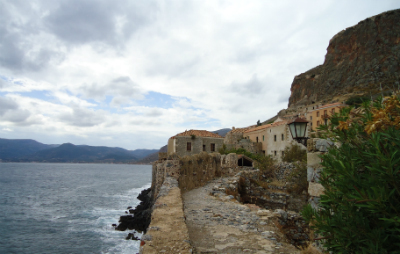 Many of the old houses have been renovated and turned into hotels, cafes and tavernas to cater for the many tourists that visit Monemvasia. 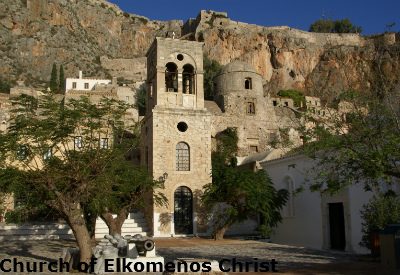 The largest of the churches is that of Elkomenos Hristos (Christ Elkomenos = Dragged to the Cross), the cathedral of Monemvasia, It was famous for the picture of Christ Elkomenos, which was removed by Isaak Angelos and transported to Constantinople. In the place of the old picture is one with the same subject from 1700, painted in the Ionian Islands. There is however a superb painting of the Crucifixion dating from the 14th century and two marble imperial thrones. The oldest church is St. Paul's, which was built in 956, and today houses the museum. 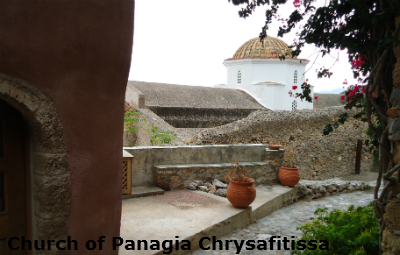 Further on, towards the eastern edge of the lower town and closer to the sea is the whitewashed Our Lady of Chrisafittisa, which was built in the sixteenth century. The large-domed building opposite the Church of the Elkomenos was, according to tradition, the church of Agios Petros, bishop of Monemvasia. During the Turkish occupation it was a mosque and today houses the local museum. A very strenuous uphill walk waits for those who want to see the upper town! A fortified zigzag path leads from below to the Fortress on the summit with wonderful views of the lower town on the way up and from the top. 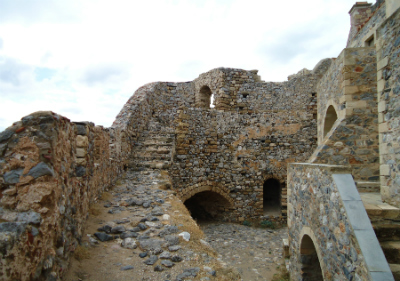 There one can see the remains of Byzantine houses and public buildings, the walls, guardhouses and towers and a vast cistern that ensured a water supply at times of siege. The upper town is entered by a tunnel that still retains its ironbound gates. At the eastern tip of the rock stands the greatest monument of Monemvasia, the church of Agia Sofia. It is of the octagonal type, like that of Dafni. Photograph courtesy of D1v1d on Flickr. The Church of Agia Sofia is among the oldest and most important Byzantine churches in Greece. 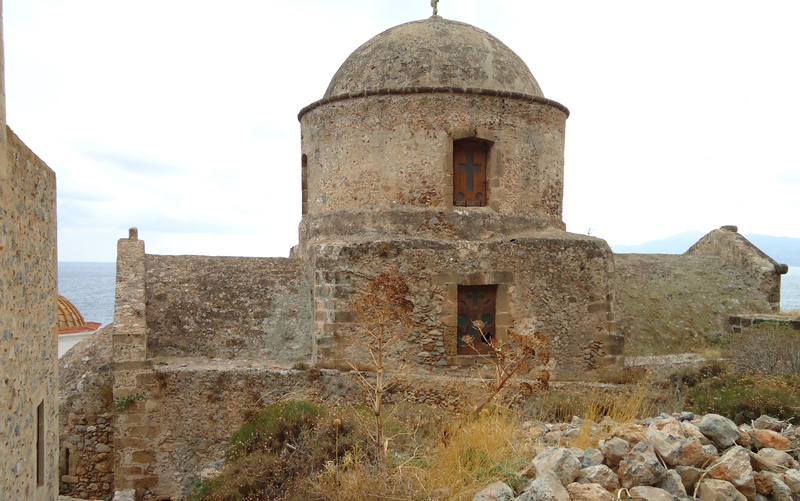 It stands on the highest point of Monemvasia and gives great view to the Aegean Sea. This church was originally established in the 12th century by the Byzantine emperor Andronicus II and it was dedicated to Panagia Hodegetria, which means the Virgin who leads the way. It followed the fate of the town, becoming a catholic cathedral during Venetian and a mosque during Turkish occupations, when its wall paintings were covered by lime. Photograph courtest of Aristofanis on Flickr. After Greek Independence, it was dedicated to the Wisdom of God and was named Agia Sofia. Time and wars caused serious damage to the church, the western side was restored in 1827 and 1846; the entire church underwent considerable restoration by Evstathios Stikas in 1958-59. Time and alterations to the church have not detracted from its beauty and charm. 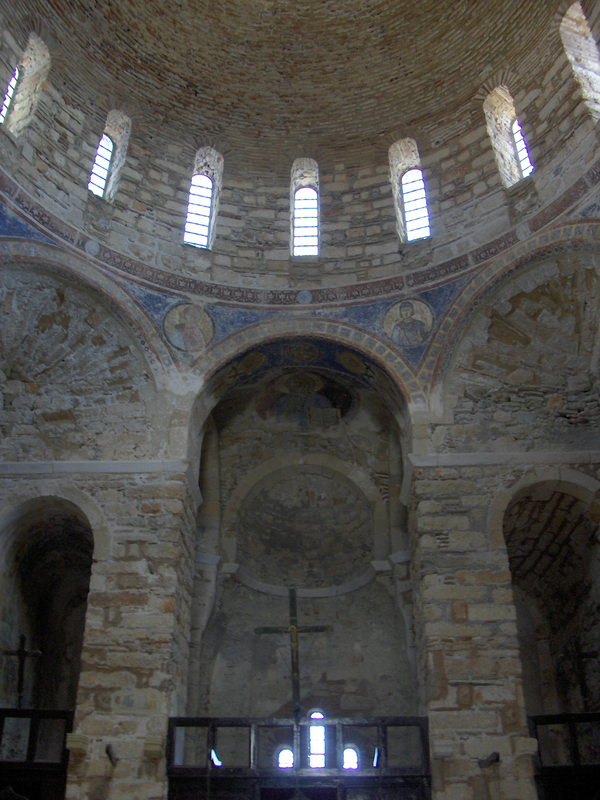 The interior is magnigicent, the few frescoes that have survived are very impressive. Take time to walk all around the plateau as the ruins are really interesting and the views from certain points are amazing. In 1911 the last residents moved off of the plateau of the rock, which, since then has become nothing more than an expanse of ruins. Statistics from 1971 recorded Monemvasia having 32 residents in the lower town as most of it's inhabitants left during the Nazi occupation of WWII, and the Greek Civil War, which ended in 1949. Many young people leaving to go to Athens, Canada, the USA and Australia. The Greek archaeological authorities carefully maintain this pre-medieval castle so that the traditional character of the settlement is preserved. Every building is restored according to the architectural specifications of the original building. 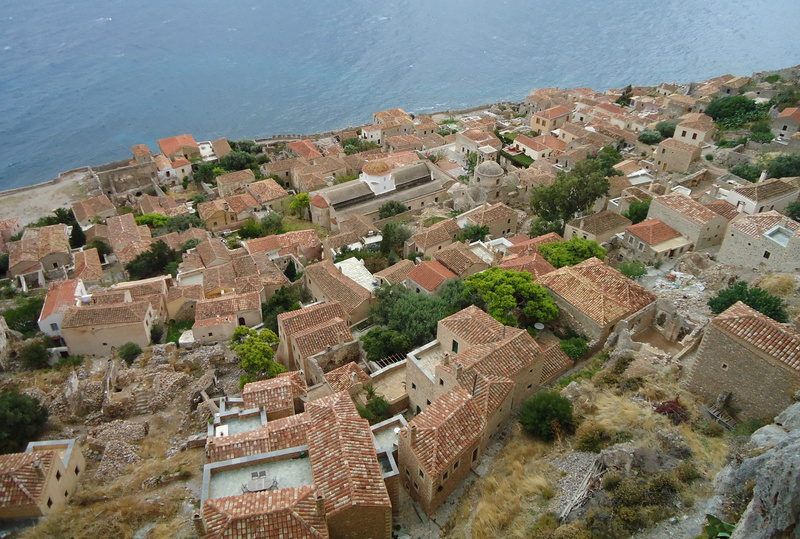 There are no modern houses in Monemvasia. Give yourself plenty of time to visit Monemvasia. I arrived in the early afternoon and spent 4 hours there but it was not enough. I could have stayed a lot longer!